Yes, you get marks on your hands, but the work in your arms is worth it. How do you walk your downward dog? I’m tempted to say, “let me count the ways,” but there are so many. Let’s just look at one breed of dog, the group that uses height to get a specific effect. Put your hands on the bricks as close to your wrists as you can. If you’ve spent much time in Iyengar yoga classes, you already know that raising your feet on bricks or a stool eases your hips in downward dog, but makes your shoulders work harder. Putting height under your hands, on bricks or a chair seat, eases your shoulders and helps you put more weight into your legs. But lift your fingers, and you’ll feel the effects all the way up your inner arm – in the same way that lifting your toes in Tadasana brings your legs alive all the way to the tops of your thighs. Our inner arms tend to be shorter than our outer arms. When you lift your fingers, you can increase the work of your inner arm, lifting and lengthening your biceps. In the preparation, focus on pressing your inner hands down and pulling your inner upper arms up, all the way to your collar bones. That’s especially useful for all of us who have overly flexible joints – “leaky elbows” that move too far toward each other when we straighten our arms. I don’t find it so myself, at least in a moderately long holding, although the word “uncomfortable” certainly springs to mind. And you do end up with impressive lines on the heel of your hand. Place your hands, as close to your wrists as possible, at the front edge of the bricks. 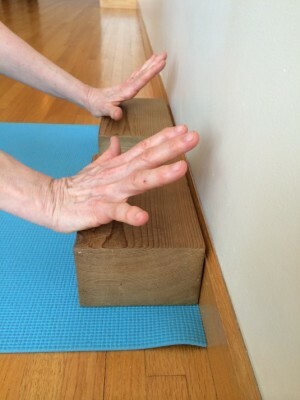 Come onto your hands and knees, lift your fingers as much as you can away from the brick, and begin to work your arms. From your thumb mounds, lift up your inner arms toward your collarbones. Broaden across your collarbones, then firm your outer shoulders in toward the shoulder joints – without losing the width of your collarbones. 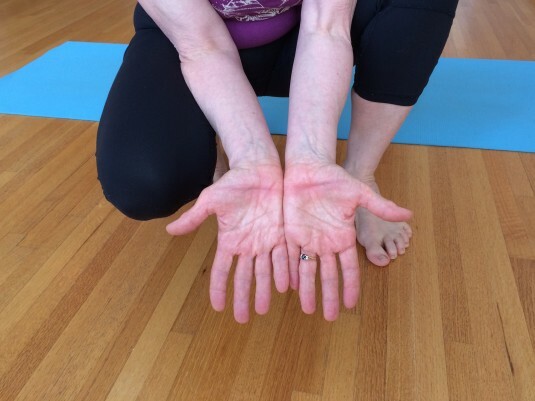 Keep the actions in your inner arms as you slowly move into the pose. Keep those actions as you lift your pelvis. Move slowly, keeping your awareness on the actions of your inner arms as you move more deeply into downward dog. If you do find the wooden brick painful on your hands, there are a few work-arounds. You might, for example, pad the edges of the bricks with sticky mat – mini-stickies made from cut-up old mats work well. The chair back goes upside down against the wall, with the bottom side of the chair seat facing out. You’ll get the same effect of lifted fingers, without the sharp-edged pressure into your wrist. Using the chair gives you much of the the same effect as lifting your fingers, but without the fancy marks on your palms. 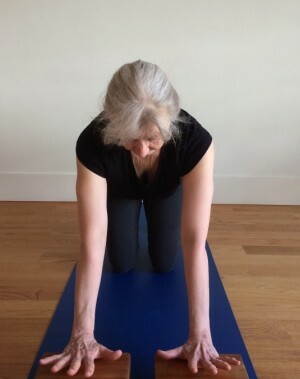 No matter how you set up the pose, spend plenty of time working your arms with your knees still on the floor. It’s more important to feel the lift of your inner arms all the way to your collar bones than it is to “complete” the pose. Besides, in the preparation, you can focus on one arm at a time. I find it hard to get the action in both arms at once. It helps to look at one arm and focus on lifting that inner arm, then hold the action as I transfer my gaze to the second inner arm. It’s rewarding to see the muscle elongate and lift. So how does this work for you? Do you know an especially enlightening breed of downward dog? Do tell. The block method awakened my pose just the way you described. 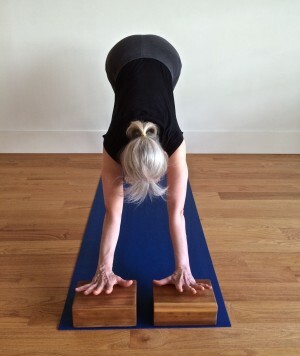 I like how the blocks also keep the wrists well aligned, (with hands pointing forward and wrist creases parallel to the front edge of the mat). 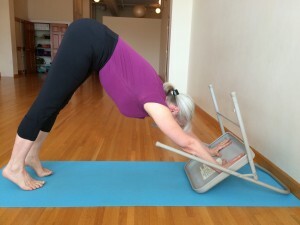 Re upside-down chair: What about placing palms on the bottom rung, for students with tight hamstrings? Either rung, depending on how much height they need? Enjoy your posts! Your other blog, http://ant-and-anise.com, is also a gem! Hey Luci, I’m glad you like it. I’m guessing the chair rungs could work – just so long as the chair doesn’t get tippy. I’ll give it a try the next time I’m near a chair. Thanks for your mention of Ant and Anise – I keep meaning to finish my post about the Spinach and Gruyere Scrambled Eggs I had in Los Angeles, and have been making every since. Soon.